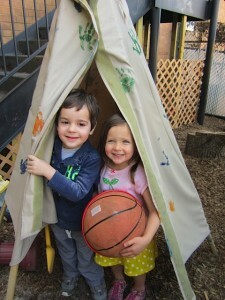 Preschool children are learning all the time – and they learn best through play and being active! Like other preschool children, your child probably asks lots of questions: How does this work? What makes plants grow? Preschoolers are very curious about their world. In our program we help your child to develop their natural curiosity. We want them to see themselves as inventors, problem solvers, discoverers and capable learners. We encourage your child to observe, explore, take things apart, build, create, draw, and see what they can find out. You probably have academic goals for your child; to be a good reader and writer, to solve problems in math and science, to be a good citizen in the world, to appreciate the arts, and to use technology. We share the same goals, but learning in preschool looks different from learning in elementary school. The key to successful learning experiences is to figure out what interests your child. We use those interests to engage your child in actively exploring and learning about the world around them. We help your child develop a love of learning. 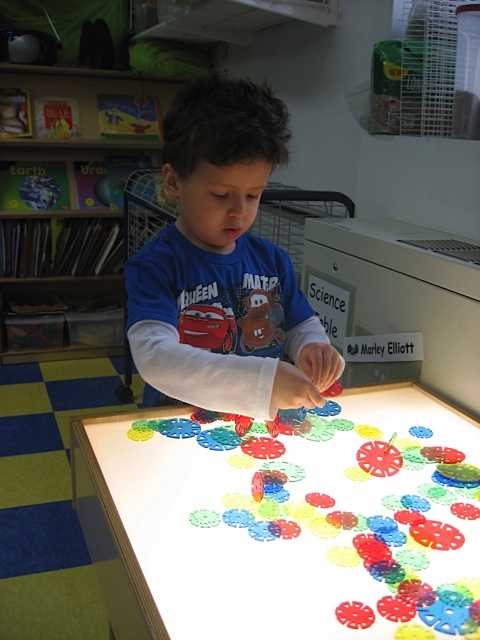 Our preschool curriculum is infused with the ideas and interests that emerge from the imaginations of the children. Our approach is primarily developmental, stressing social skills, exploration, discovery, independence, and creativity. Through the encouragement of cooperative decision making and guided classroom conversations, our talented teachers skillfully incorporate elements of history, science, geography, storytelling, language and writing, numbers and mathematics into on-going, expanding creative multi medium play projects. In other words, thoughtfully guided fun! Our preschoolers days are filled with lots of imaginative free play and rich experiences in the arts, dramatic play, nature, numbers, language and early writing. Special teachers visit the classrooms regularly to present activities and experiences in music & movement, sports & fitness, and foreign language exposure. The more active children are in their work, the more they learn and remember. Each of our centers has two preschool classrooms; a 3-4 year old class and a 4-5 year old class. Each class has twenty children. Our preschool rooms are bright and sunny, and beautifully equipped. Our teachers are enthusiastic, experienced and continuously trained. They are kind and nurturing. Many children in this age group are still learning to use the potty. Weather a child is three years old or five years old, our experienced caregivers are there to provide positive encouragement and support to the children (and their parents!) as they navigate the transition to a diaper free life! We provide cots, sheets, blankets, bibs, cups, utensils, nutritious snacks, milk and water.